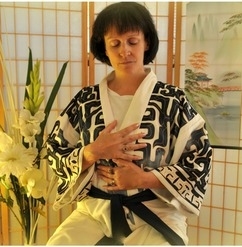 AMA, A REIKI MASTER/TEACHER AND MEMBER OF THE UK REIKI FEDERATION, HAS BEEN A HEALER FOR 25 YEARS. I was born and brought up in France, took an Honours Degree in English at the University of Haute Bretagne, an M.A at the Sorbonne and several Conservatoire Music Diplomas. I started teaching music aged 18. At the age of 24, I moved to Oxford where I carried on teaching (French and Music). In the early 90s I attended a Healing Course run by a gifted Spiritual Healer called Les Gillam. Following that course I was happy just giving healing informally to friends and relatives for years. As my interest in healing in general was rapidly growing, I qualified as a Holistic Massage Therapist (Oxford School of Massage, 2006), and extended my learning to the related fields of Aromatherapy and Reflexology. Then I noticed the word 'Reiki' cropping up everywhere... After some research online, I did Reiki 1 Level with Reiki Evolution, soon went on to Level 2, and completed their Master/Teacher Course in 2007. I never looked back... Not only did the treatments I gave friends become significantly stronger right from Reiki 1, but I was very impressed with the simplicity yet great effectiveness of the Self-Healing aspect of Reiki. In the spring of 2009 I was giving myself Reiki (routinely, for a few minutes several times a day), when I noticed that my right hand kept being drawn to my left breast/armpit and felt very hot - a standard response for places that need healing. After 3 or 4 weeks of this repeated pattern, I visited my GP and asked her to examine my left breast. She didn't find anything abnormal. Back home however, things hadn't changed: my hand kept being drawn to the same place and was burning hot, but this time I also noticed that one of the lymph glands in my armpit had swollen up. I made an urgent second appointment with my GP, said that I was a Reiki practitioner and strongly felt that something was wrong. Alerted by the swollen gland, she gave me another examination and this time did feel something. As the tumour was an unusual (leaf) shape, even I could not really feel it through touch either. I only picked it up energetically. A few weeks later the results came back and yes it was cancer, a rare and aggressive form called 'micropapillary'. When I emerged from the operation, being the inveterate 'Reiki explorer' that I am, I took this golden opportunity to investigate the effects of self-Reiki on pain. I told myself I wouldn't be stupid, and would ask for painkillers as soon as I needed them. Well, to my surprise and delight, thanks to -I admit!- very intensive self-Reiki, I didn't need ONE painkiller... Not one, either at the hospital, when the other ladies in the ward were given some every few hours, or during the recovery weeks back home. No pain was felt. Due to the very aggressive nature of this particular tumour, it was agreed that I would receive chemotherapy, radiotherapy and hormonal treatment. On the whole I managed to deal with the news relatively well, but one Sunday night, about a week before the start of the chemo, I admitted to myself that I was rather anxious about the chemo part. This simple insight was a turning point in both my personal and professional life as it caused a huge shift in my whole attitude towards illness. FEAR (the great killer) had simply vanished out of the equation. ... while the Teacher part of me decided to use this experience and invite my Reiki students to practise on me (in all my bald glory!) and overcome their own fear of this sadly increasingly common illness. but even more importantly, it helped me reach an enduring sense of Inner Peace.